Have you ever imagined that you could talk to animals? Well, for me I wish I could. 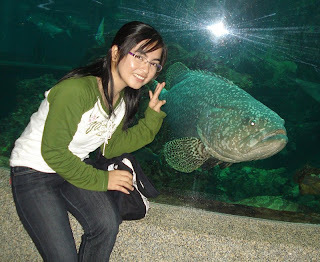 As you can see in the picture I'm promoting myself with the biggest fish (at that time laa...hehe.) when made my visit to Universiti Malaysia Sabah Borneo Marine Research Institute - Marine Aquarium & Museum. Oppss...I forgot what was the name of the fish.. I named it, UMS Biggest Fish, hehe... This picture was taken when my collegue of mine and me accompanied our supervisor's foster daughter from Japan to take a look in the campus... It was a sweet memories ever to meet a real Japanese girl (will not publish her picture in here, in order to respect her privacy...sorry my dear readers....hehe..) live i front of me. I'm not going to keep on talking bout the fish or mermaid that I found there...(Dugong? Should be added in the list..could attract people to see the "real mermaid"...hmmm, maybe need to enlarge or relocate the aquarium before that, pheww...). Michael Jackson a.k.a Jacko, everyone in this world gave him "King of Pop" title. Frankly to say that, instead of following his career life, I'm much more addicted to his tribute songs towards humanity. Yes, two thumbs up for Jacko's "Heal The World" song. This is the only song lyrics of Jacko that I could still remember up until today. The spoken words before the song was very touchy, sincere without any senses of racism. "Think about the generations and to say we want to make it a better world for our children and our children's children. So that they know it's a better world for them; and think if they can make it a better place." I came to realized the hope of future generations, will our world still survive for another generation, if we care enough for the living, is our mother earth still a better place to live in? How about war? Everyday, there's been wars here and there...will our generations survive? An then, the song begins, "There's a place in your heart, and I know that it is love...". LOVE is universal, love knows no boundaries, love recognizes no skin colors, love is give and take...Why love? The lyric goes again, "If you want to know why, there's a love that cannot lie...Love is strong, it only cares for joyful giving....if we try we shall see In this bliss we cannot feel fear or dread...". And I know it's love for one another as you love yourself...As a reflection to myself, I'm not the one who cares so much about the animal, in short, not an animal-lover, but I will not do something that could harm the animal population or whatsoever related to it.